For the past one month, we’ve been busy clearing up the garden of unwanted plants, unkempt growth and appearance, and the like, especially propagating what were needed. Top on the list was this pot of Anthurium andraeanum or Flamingo Flower, as seen in the first image below that screams to be attended to. How unsightly! There was a definite need to propagate all those plantlets that have matured on the stems over the last 5 months, something which I have procrastinated far too long, even though the job is so easy. 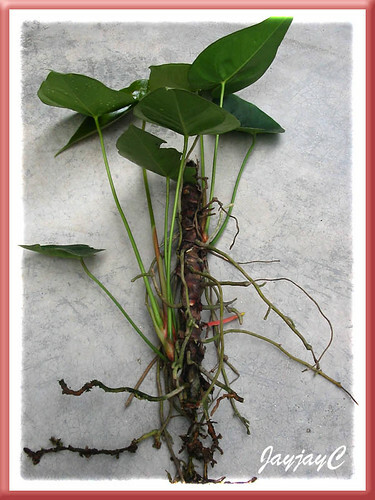 For the gardener, the easier methods of propagation of Anthuriums are by stem cuttings, layering and division of offsets or suckers that sprout laterally from the base of the plant. It can also be propagated by seeds which are rarely available and commercially, by tissue culture. In this article, I just want to share how it can be easily multiplied by stem cuttings. Step 1 – When the plant has grown too tall with leggy stems, cut off with a sharp knife the top crown of stem that includes its leaves and replant it into new potting media. Leave the remaining lower portion of the stem as is in the pot and with regular care, it will develop plantlets all along the nodes and even offshoots from the base as seen in the image. Allow these young plants to mature and produce their own roots before severing them from the parent trunk to pot them individually or in a set of 2-3 plants depending on the pot size. Step 2 – Try to gently spade out one stem at a time from the pot. It is quite easily done as they are not deep rooted. Step 3 – Use a sharp knife to separate the plantlet from the stem, by cutting about half to one inch above and below the plantlet along the stem, carefully retaining the aerial roots therein. Step 5 – Carefully plant the young plants in a pot filled with a sandy loam medium that is humus or organic-enriched. Depending on the pot size, you can plant each singly or collectively as desired. Wet through thoroughly and locate in a filtered site. It can also be grown direct into the ground. That’s all… simple and easy, yeah! 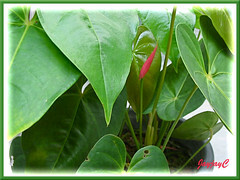 Update 1/10/2012 : There’s another article on how to propagate Anthurium by division here, if you’re interested. Anthuriums are hardy plants and with proper care, they’ll reward you endlessly with beautiful and lasting blooms. 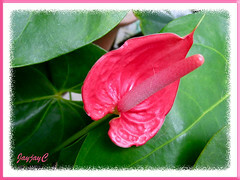 Learn more about Anthurium andraeanum or Flamingo Flower. How wonderful to note that one of the stem cuttings planted in March had matured and is flowering for the first time. A tiny pinkish-red bud emerged unexpectedly sometime during the last week of August to our delightful surprise. Until today, the slender torpedo-shaped bud, the length of my little finger, is still unopened…rather slow-growing! Really took its time…haha, sort of teasing us as we await rather impatiently for its full bloom! Almost 2-3 weeks from a tiny bud to a blossoming beauty, opening to reveal the soft pink spotted spadix and rosy-pink spathe. Simply beautiful, isn’t she? You have delicately remove all the plants from the growth mess, something not easily done but I guess most gardeners wished its easy done than said. I had sometimes carelessly handled and had broken the young stalks when the roots are too hard and tight with the rootball & all. Hope your plant flowers furiously. Thanks, James! We hope so, too. So far, no flowers yet but growing very well. Thank you so much for the info , because I have an old plant with lots of woody stems. And wondered what to do with it. It the large Flamingo plant ( don’t know the name ) with the heartshape leaves and the huge flowers , used by florists. I also wonder if you can cut the stem in several pieces ? Have you got any idea about that ? You’re most welcome, Wil! I have not tried cutting leggy stem in several pieces before. What I first did was cut the top portion which is the crown together with its leaves and planted it as a new plant. Somehow the cut had induced the remaining lower stem to sprout new plantlets for propagation. Probably you may want to experiment cutting the woody stem of your plant about a foot from the ground to encourage the lower portion to produce new plantlets. Then, take the severed top portion, cut off the crown together with the leaves for replanting and use the remaining section to cut into several pieces to experiment growing. I somehow feel that if each small piece has a stem node (plus aerial roots or slight indication of them), there’s probability of new growth. Happy propagating and wish you success, Wil! This is great information. I have had this plant for over a year now and it has never rebloomed. The leaves are healthy looking and keep growing but I would like to know what I should be doing to get it to bloom. Thank you. Thanks Christine for your kind words. 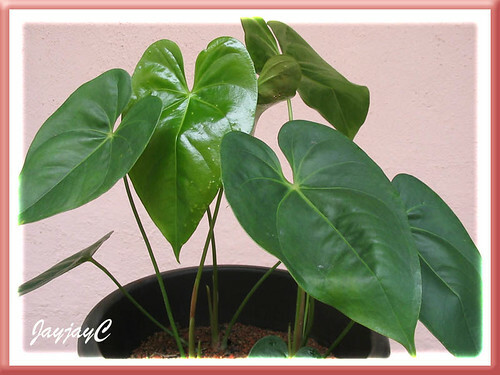 Re your plant, probably it needs feeding with a liquid (or slow-release) flowering houseplant fertilizer, if you haven’t done so. Welcome and thanks for your kind encouragement, Cecile! We’ve never use a plant food spike before, but if it’s nutrients for your plant, why not, provided you follow the directions on the packet! All the best…may your plant flowers profusely for you. Hi, I’ve just found your page on Anthurium propogation and found it very helpful. Could you help me further by telling me if once you cut the top part off a large plant is it a good idea to let the cut dry before potting it up? Also my plant has a lot of new growth (plantlets) around the bottom of the stem. Is it okay to leave them as they are so as to grow the Anthurium as a larger specimen? Or would they not develop as well as a single plant? Thanks in advance for any advice you can give me. Hello: I have three plants that I love very much, white, pink and deep red. I am interested in propagating each has a lot of babies and I am wondering if the babies can be separated and planted separatelly. I have them inside the house and also want to know if they will survice in the porch. I live in Fort Bragg, CA..
as coastal region, it get cold. I also have a green house and wonder where it will be best to keep them. In the house they are doing great, I have had them for quite sometime and so far they have not stopped blooming. Please gve me some advice, I will be very grateful. Hi Margarita! 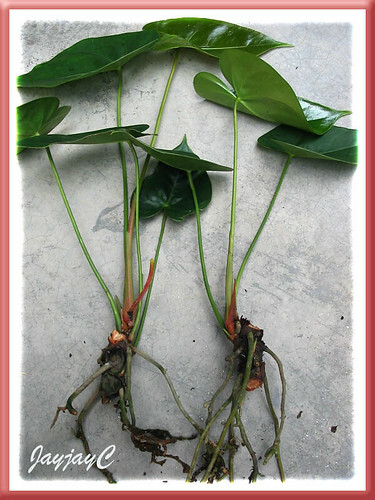 Yes, you can propagate Anthurium by dividing the offsets or babies. As you’ve already known, they’re great indoor plants. Our tropical climate in Malaysia is ideal for them to be grown outdoors too but I’m unable to advice you as we do not experience the 4 seasons as you do. Hope some readers visiting here can help you. i have planted 3 plants in the ground and although they seem to be doing well they do not seem to actually flower. Each time a tiny red stalk appears I get excited that a flower will soon appear but each time the red “flower” opens up, turns green and becomes just another leaf. Any thoughts? Sorry, Stephen….we’re clueless about this strange happening. All the best to you and happy gardening, Veronika! You’re most welcome, Praveen! Have a great week ahead. I find the information very informative and instructive Iam going totry the suggestions and let you know what the results are. Thank you very much. Thank you so much for your compliment, Conrad! Looking forward to know your results. Wish you all the best. Thanks, Mel… for your generous compliment. It made our day! I don’t monitor their growth but just guessing that it’ll probably take about 1½ – 2 years to grow 1 ft tall stems. Sorry, Lynah… I’m unable to assist you as we’ve never grown a pitcher plant. Kindly google further for answers. 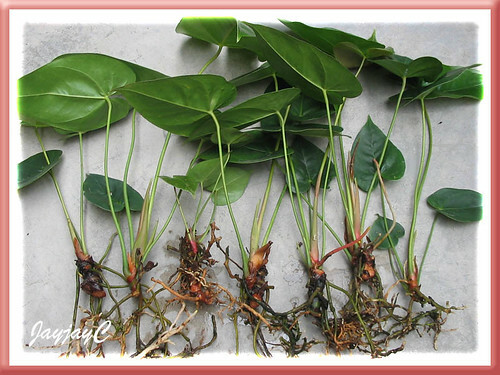 Thank you so much for your clear instructions with photos on both ways to propagate Anthuriums. I have quite a number of them in pots under a shadecloth covered garden with fishpond. Some of the plants are several years old and quite leggy, including my favourite large pink flowered one. I will now get busy and multiply them! You’re most welcome, Noreen. We love sharing our gardening experiments and if it helps others and make them happy, that’s our reward. May your anthuriums bloom all year round to delight you. 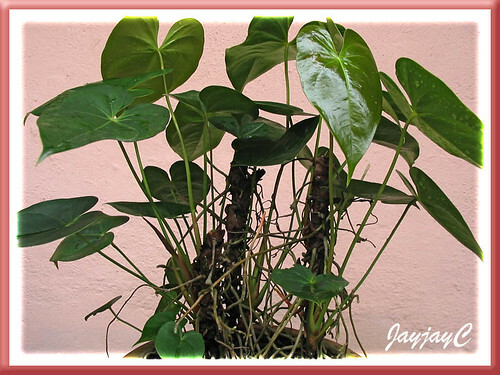 Hi Jacqueline, I have delayed tackling my anthurium for many years but now, thanks to your advice, feel confident to propagate its offshoots. Thans so much for your help. I really appreciate it. Hello Jacqueline. I really love reading your site. It’s very informative and your photos are really helpful. I’ve been wanting to propagate my Anthurium for a while but I just don’t know how. Now, I’m ready to do it! I hope you can teach me how to propagate Aloe Vera as well. People say it’s easy but it’s not for me. I also want to know how to make my Kalanchoe bloom. I’ve had this plant for a long time and they’re growing quite well but reblooming is what I really find hard to do. If you can share some of your expertise on these matter, I will really appreciate that. You can also email your reply to me. Thank you so much! Much thanks for your thumbs up on our garden articles. We’re delighted to know that they were helpful. Jacqueline, Great artical on the anthurium propagation. I was hoping for your urgent help if possible.